BEIJING, April 18 (Xinhua) -- China announced Tuesday a military reshuffle with 84 corps-level units newly adjusted or established, a move hailed by President Xi Jinping as another major step in strengthening the country's armed forces. 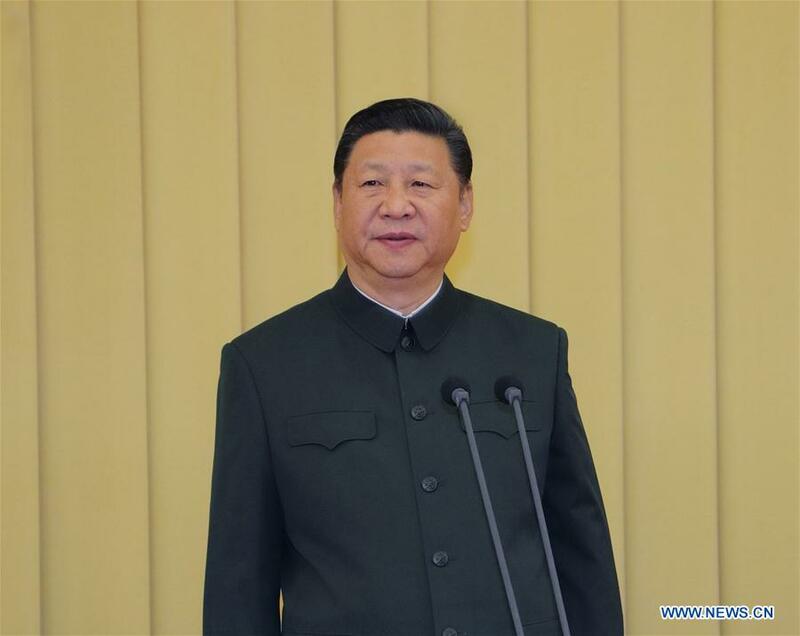 Xi, who is also general secretary of the Communist Party of China (CPC) Central Committee and chairman of the Central Military Commission (CMC), made the remarks while meeting chief military officers Tuesday in Beijing. Decided by the CPC Central Committee and the CMC, the reshuffle is important in building strong armed forces through reform, said Xi. It will also have a profound influence on meeting the targets of enhancing the military in a new situation and building world-class armed forces, Xi noted. Identifying the 84 units as crucial parts of a new system, Xi called on them to safeguard China's sovereignty, security and development interests. During the meeting, Xi ordered the newly reshuffled units to adhere to the Party's absolute leadership and obey the command of the CPC Central Committee and the CMC. He also stressed political guarantees in the military restructuring, requiring the military to firm up their belief, abide by political discipline, and stick to the correct political direction. The military units should ensure combat readiness and conduct more research to achieve that end, Xi said. Setting the goal of building "an indestructible combat force," Xi said major improvements should be made in fighting capability to adapt to integrative joint operations and the new military system. He ordered corps-level units to take the initiative in reform and innovation to increase the science and technology content of the military, boost real-combat training and accelerate the upgrading process to make the military more competent, efficient and sci-tech intensive. The president also urged the military to promote revolutionary heroism and collectivism. The People's Liberation Army (PLA) has experienced a series of historic changes in its organization and structure since 2015. In September 2015, China announced that its armed forces would be cut down by 300,000 troops from the original 2.3 million. The general command of the PLA Army, the PLA Rocket Force, and the PLA Strategic Support Force were established in late 2015. The previous seven military area commands were regrouped into five theater commands, and the four military departments -- staff, politics, logistics and armaments -- were reorganized into 15 agencies in 2016. With those reforms, China's armed forces has transformed into a system in which the CMC is tasked with the overall administration, while theater commands focus on combat preparedness, and various armed services pursue development. China had also pledged to make advances in reforming the military leadership and management system, as well as the joint battle command system by 2020.